First things first, please be aware that I have changed my blog address to www.greenfairyquiltsblog.com, if you can update your links from the previous www.greenfairyquilts.blogspot.com that would be great! You can also follow my blog via bloglovin' by clicking on the link on the right sidebar. Thanks! 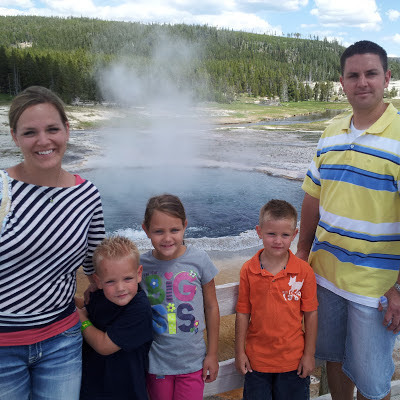 Clint and I took our oldest 3 kids, leaving our 2 year old home with Aunt Jessie, to Yellowstone National Park. 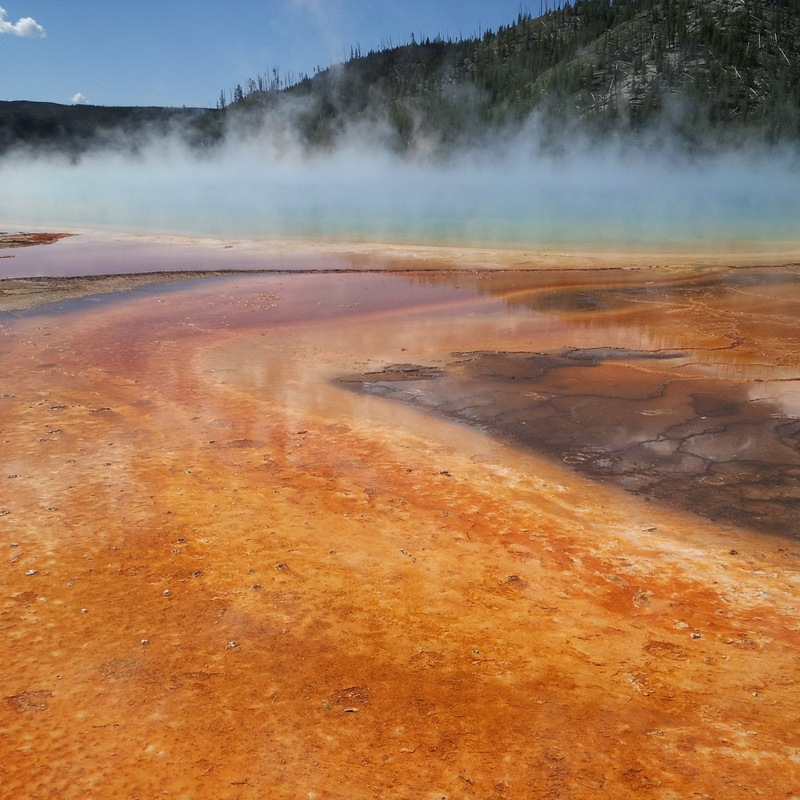 It was a wonderful time spent with family and it made it better for me, knowing that I didn't have to worry about my 2 year old escaping from me and landing in a boiling hot water hole. I am crazy spastic about the safety of our kids (who isn't) but I am a little extreme when it comes to worrying, just ask my family. 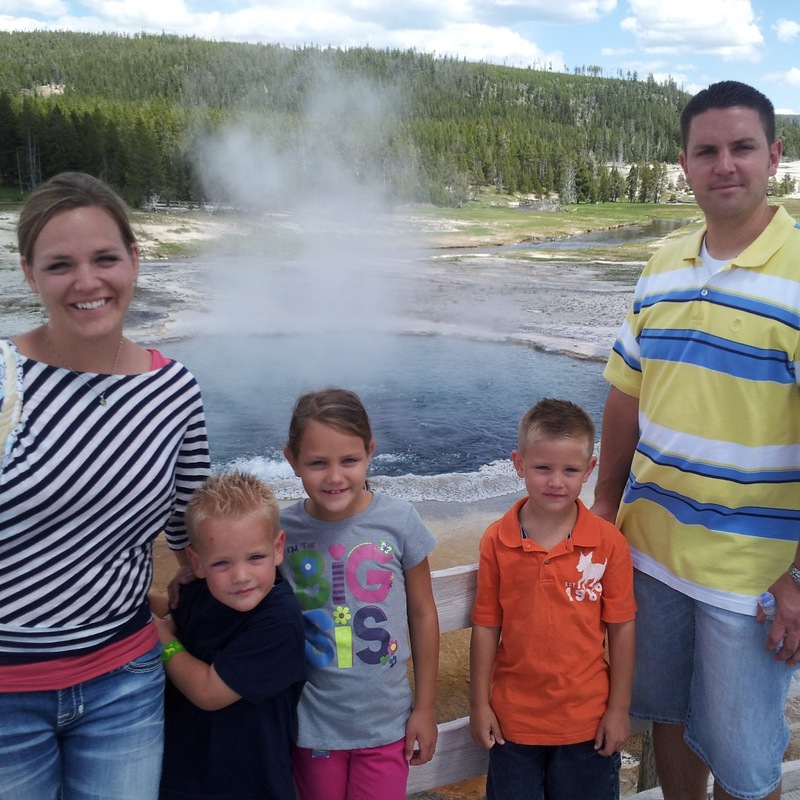 Anyway, it was beautiful - it was our first trip to Yellowstone and it was worth the drive. Thankfully we broke it up and had time to visit family in Salt Lake and Idaho. 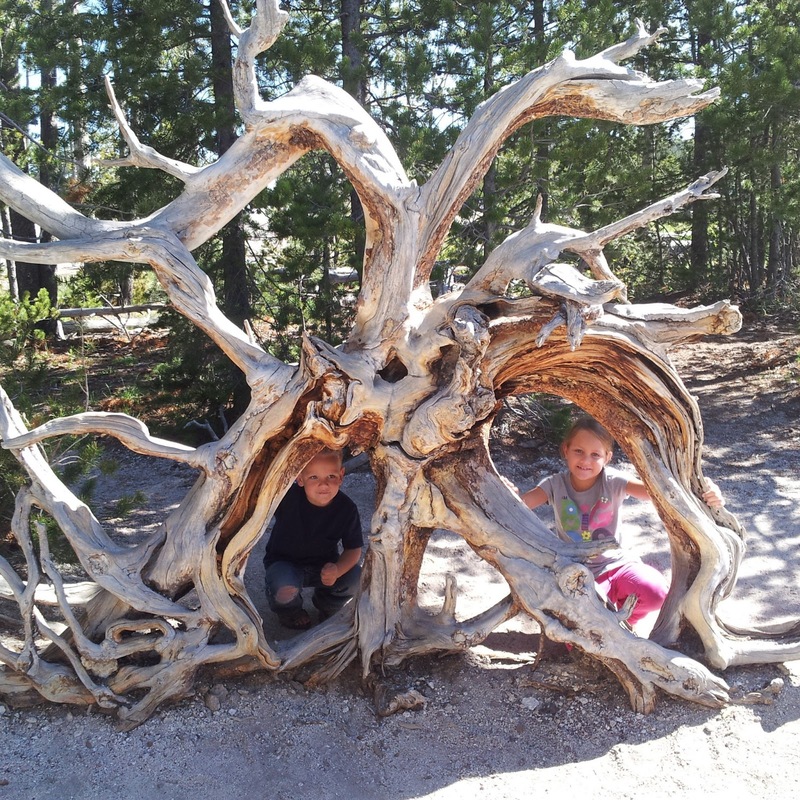 There were so many different things to see and explore. I could share all of it with you, but really - you should go yourself. It is worth it! This tree root was incredible - I am assuming that roots grow wide because it is too hot underground, then when they are too big they fall over. There were a ton of trees like this. The colors were amazing, the toxic water made for incredible pictures. 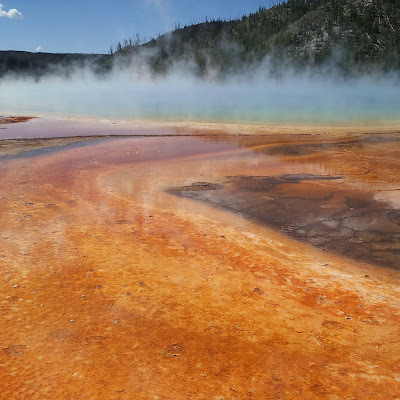 The blue steam coming up from the water is so cool and I love the orange bacteria. So pretty! 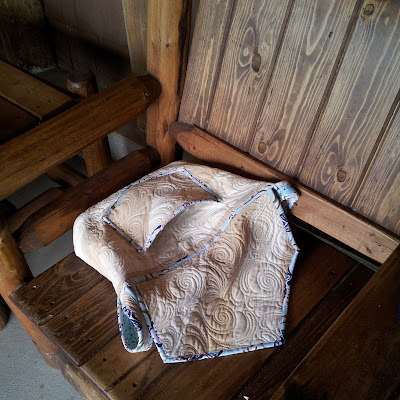 I had to take this picture of my bag, it was the perfect lighting to show off the quilting texture. 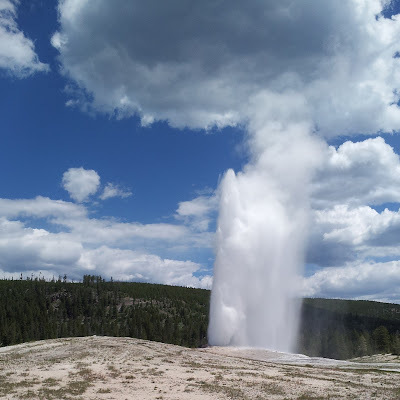 Old Faithful - something I have heard about but didn't get to see until this trip. The geyser was so fun to watch. See the clouds? I was in heaven with how blue the sky was and how white the clouds were. I have over 50 pictures just of clouds on my phone camera - I have a slight obsession. Anyway - I hope you all are having a wonderful summer. I know I am, it is a little crazy right now - but it keeps life interesting. Right now I am finalizing classes for AQS Quilt Week in Phoenix. This will be my first teaching experience at a big show, I am a little nervous - but I hope to see a lot of you there to help ease my nerves. I will be teaching 6 longarm quilting classes. I have a few other teaching opportunities coming up as well and will be traveling to Edmonton, Canada in April of next year. Once I have all the details I will add that event to my list. If you will notice at the top of my blog, I have "Events" as a new category and you can find information for where I am teaching there. So, here is where you come in. I need to come up with some classes and I would like your input. If you were to take a class from me, what would you want it to be on? Thanks everyone! My longarm machine arrived today, so I'd be interested in all sorts of classes. Besides classes on techniques, I'd really like to learn how to come up with the perfect quilting for each quilt. Your quilting has so many elements that I've never seen anywhere else before, and I love it so much! Glad you had a great time away with family Judy. Classes from you... how super exciting for all of us!!! I would love to take a class on custom quilting with you. It would be awesome! I'm so glad to know you will be coming my way in February. Winter is beautiful in Phoenix. I'll be in a booth there too, and will look for you! I'm happy to know that I am not allone in the skills of worrying. Mine is inherrited though, My mom was even worse. ;) Thanks for sharing. Judi, I'm always awed how you come up with your designs for the quilts you do. I for one would love to take a class from you in that arena. Looks like fun! Your family is so darling! It looks fab, i hope to get there one day soon, its a long way from Australia! If i could take a class it would be in quilt designs, yours are just amazing !